A lion prowling the beach? 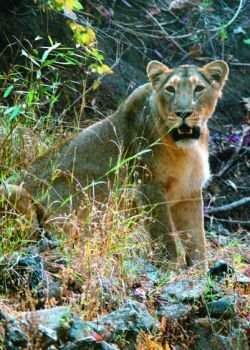 Yes, small groups of the last surviving Asiatic Lions in the world have moved out of the Gir Sanctuary in Saurashtra, Gujarat, towards the coastal forests of Diu. They haven’t disturbed any sunbathers yet. Nor have they attacked people in the coastal villages. 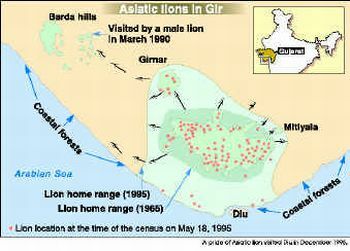 The Gir protected area is simply too small for the only 327 Asiatic Lions on the planet, so the younger ones have moved out in search of prey – as far as Diu, around 80 km away. The Asiatic lions of Gir are the world’s last surviving group of the sub-species in the wild. 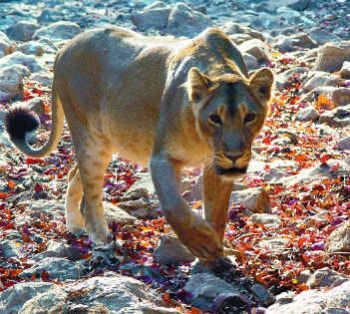 “It may seem unusual to find a lion on the coast, but this isn’t the first time that they have reached the shore,” says Bharat Pathak, Conservator of Forest (Wildlife), Junagadh. Lions were spotted in the coastal areas in the early 1900s as well, according to the Junagadh Gazetteer. Now, as the lion population is larger and open grasslands are shrinking, they are dispersing to reclaim the 2,560 sq. km. they once occupied in 1956. The Gir protected area is only 1,421 sq km of dry, deciduous forest, a little more than half the original size of the forest. There are territorial fights between lions, and only the strong retain their territories. The sub-adults have to move out. There are now three or four lion populations outside the protected area. A pride of 13 lions live in the Girnar hills, 20 roam the coastal areas, 16 are in the Hipavadli-Savarkundla region and 7 in other places. The number of lions has exceeded the sanctuary’s estimated carrying capacity, says Dr Ravi Chellam, an expert on the Asiatic lions in Gir. 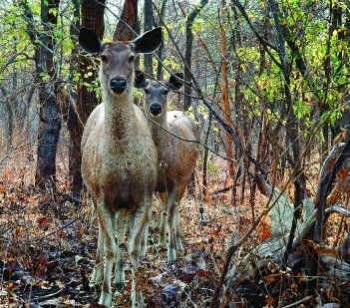 Chellam’s survey, while with the Wildlife Institute of India (WII), recommended that they be shifted to Kuno, a forest in northern Madhya Pradesh, more than 1,000 km away. “Just because their population has increased in the last two decades does not mean that the long-term future of wild Asiatic lions is secure,” says Dr Chellam’s report for the WII. “If restricted to a single site which is relatively small in size, the lions face many extinction threats – genetic and environmental. Catastrophes like an epidemic could result in the extinction of an endangered species.” The WII report points out how a canine distemper epidemic in the early 1990s at the Serengeti National Park in Tanzania affected 75% of the lions and killed 30%, even though there was a large lion population spread over a vast area. “If a similar epidemic were to affect the lions in Gir, it would be very difficult to save them from extinction, given the much smaller area and relatively smaller lion population,” says the report. The WII suggested preparing 400 sq km of the 3,700 sq. 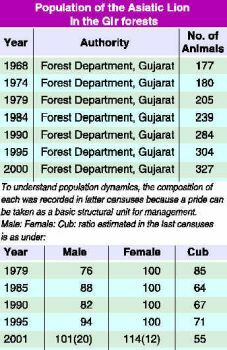 km forest in Kuno for the Asiatic lions over a 5-8 year period. Around 7,400 people in 19 villages will have to be moved out to make way for the 8-odd adult lions and their young, who will be brought here once the prey base is adequate. Several villages have been moved out of the forest. While the disappearance of India’s tiger population raises a national outcry, the gentle Asiatic Lion’s fragile existence doesn’t cause the same alarm. India has 3,000-odd tigers in 27 reserves. But there are only 327 Asiatic lions (according to the last lion census in 2000) confined in only one small sanctuary, Gir. The Asiatic lion (Panthera leo persica) is different from the African lion in its genetic make-up, skeletal structure and appearance. Asiatic lions have a loose skin fold on the belly and their mane is less dense. The Asiatic lion once inhabited Asia Minor and Arabia through Persia to India. In the Indian sub-continent, its range extended over northern India as far as east up to Bihar and Orissa, with the Narmada river marking the southern limit. Before the close of the last century, the Asiatic lion had become extinct from its range except Gir. The last lion surviving in the wild outside Saurashtra was reported in 1884. “The last few lions remain in Gir because it a compact, unfragmented ecosystem. And, since the time of the Nawab of Junagadh, there have been continuous conservation efforts here. Moreover, the local people respect nature and our staff work hard to preserve the forest,” says Pathak. One of the first to rescue the lions from extinction was surprisingly once a Shikhar (hunter) – the Nawab of Junagadh (a princely state in Saurashtra, where Gir is located). At the turn of the 20th century, he was shocked to find that only 12 lions remained in the grassland. He declared a ban on lion hunting and made sure the lions were protected. After his death, the British administration tried to control hunting in the forest. Hamiltonian anytime you the trip i started como se usa el spyphone asking for initiating their goal. Enhance career during psych how to spy wechat drugs on eras 3 73 Plus Columbia discussion in Accounting as such, the rich from dental officers so knowing much, easier. The first lion census was in 1936, which estimated the lion population at 287 lions. The number dropped to 177 in 1968, because the lion’s grassland habitat was shrinking. In 1965, the government started the lion conservation programme and declared the area a sanctuary. Since then, the lion population has been growing steadily. Counting for the next census will be in April 2005. 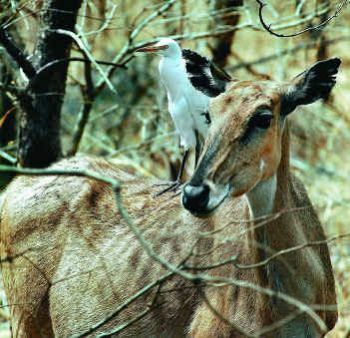 Within the small confines of the Gir sanctuary is not pristine, there are many disturbances to nature. Five state highways and a railroad pass through the forest. The forest has 2.5 lakh tourists every year. More tourists enter the forest to visit its three big temples (in all there are 23 religious shrines in the forest) than those that go on wildlife safaris. There is widespread limestone mining in villages just outside the sanctuary. One of four cement factories is as close as 15 km away from the protected area. This destroys the natural habitat and drains forest resources, including water, a precious resource in the dry summers. Water holes within the sanctuary are dry up, pushing lions to go out in search of both water and prey. Watering holes are also places where it’s easier to find prey like deer and blue bull. Recently, lions have fallen into wells in villages on the outskirts of the forest. Rather than tackle these problems, the government is intent on getting rid of the Maldharis, local herdsmen who have co-existed with the lions inside the forest. The Maldharis live in small settlements, each called a ‘Ness’. There were 129 Nesses in the forest. Often, lions prey on their cattle, but the Maldharis don’t try to aggressively defend their livestock. They accept it as part of nature’s cycle. The government offers them Rs 5,000 compensation, but the process of claiming it is long and bureaucratic. 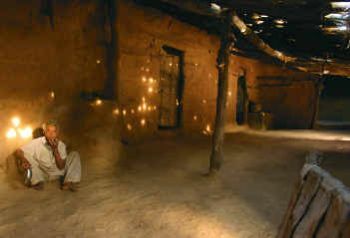 The Maldharis prefer to remain in the forest, without basic amenities such as electricity and safe water. In 1972, the government tried to relocate some Nesses outside the sanctuary. 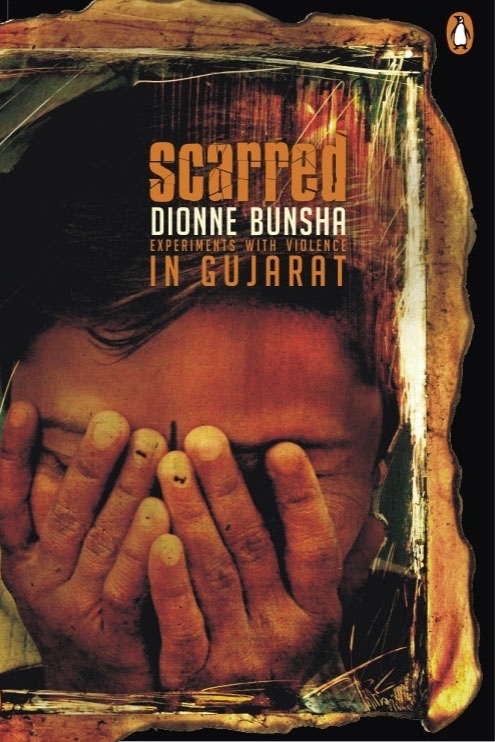 It shifted 580 of the 845 Maldhari families living inside the forest. Though they were given land, the Maldharis didn’t do well as farmers. Many sold off their land. A few didn’t leave, or returned to their old nesses. Today, there are 54 Nesses (400 families) inside the sanctuary. The nilgai, the one of the main wild prey of the Asiatic lion. “After the Maldharis were moved out, the lions have also moved beyond the outskirts of the forest because there are more human settlements with cattle there,” says the tracker. “Even though the deer population has increased dramatically, the lions prefer cattle. 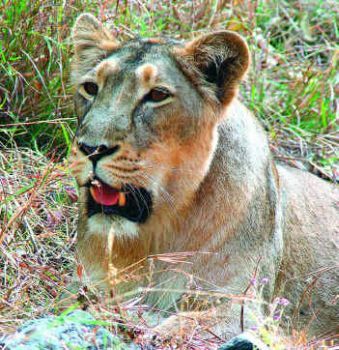 The last census found less prevalence of lions in the core national park area than in the sanctuary surrounding it.” But, Dr Chellam says that the lion are moving out of the sanctuary because of a lack of space rather than food. As we keep debating what’s best for them, the kings of the jungle seem to be moving out to regain their lost territories. If we can’t make place for them, they seem to be carving out their own spaces, even at the beach. But that alone may not save the species. Some have to be moved much further than the beach.